Jan. 29, 2014 - With growing national attention to hospital pricing practices, new data released earlier this month by the nation’s largest nurses organization showed that hospital charges continue to skyrocket with some U.S. hospitals charging more than ten times their cost – nearly $1,200 for every $100 of their total costs. “Such inflated practices continue to price far too many Americans out of access to needed medical care or expose them to financial ruin. It’s long past time to rein in the price gouging, and recognize that a healthcare system based on profiteering puts all of us at risk,” said Jean Ross, RN, co-president of National Nurses United, whose research arm, the Institute for Health and Socio-Economic Policy, conducted the research. NNU and IHSP list the 100 most expensive hospitals, top 10 for each state, and the 50 most expensive hospital systems. 14 U.S. hospitals charge more than $1,000 for every $100 of their total costs (a charge to cost ratio of 1,000 percent) topped by Meadowlands Hospital Medical Center in Secaucus, NJ which has a charge to cost ratio of 1,192 percent. The 100 most expensive U.S. hospitals have a charge to cost ratio of 765 percent and higher – more than double the national average of 331 percent. 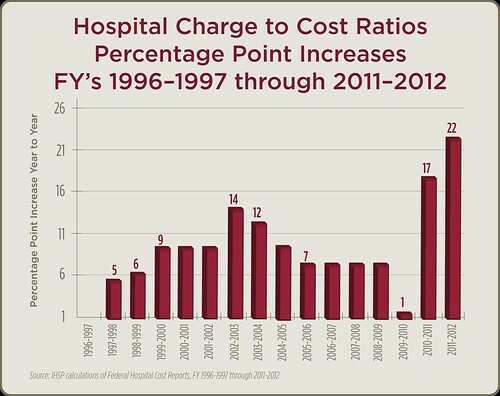 Despite enactment of the Affordable Care Act, hospital charges recorded their single biggest jump, a 22 percentile point increase from fiscal year 2010-2011 to fiscal year 2011-2012 in the past 16 years for which the IHSP has analyzed the data. Six of the nine most expensive hospitals are part of two big chains, Community Health Systems, Inc. and Health Management Associates which are currently pursuing a controversial merger that critics charge would further drive up prices. For-profit hospitals continue to dominate the list of those with the highest charges. For-profit corporations average charges of 503 percent of their costs, or $503 for every $100 of total costs. By contrast, government-run hospitals, including federal, state, county, city, or district operated hospitals, with public budgets and boards that meet in public, exercise far more restraint than for-profit or non-profit corporate chains. 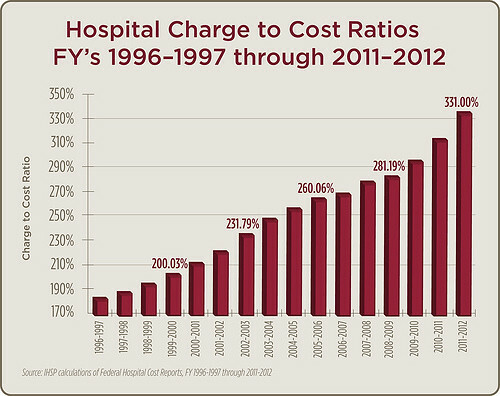 Average charge ratios for government-run hospitals are just 235 percent of their costs. Public oversight or regulation seems to help constrain excessive pricing. Maryland, probably the most regulated state in the U.S., has the lowest average charges of all the states among its 10 most expensive hospitals. The findings are based on publicly available Medicare Cost Reports as of June, 2013, covering the federal fiscal year that ended September 30, 2012. Top 10 Most Expensive Hospitals in the U.S. The IHSP has analyzed hospital charge data for years, noting prices, and a correlating spike in hospital profits, that hit a record $53 billion nationally for 2011, according to American Hospital Association data. Hospitals, notes NNU, are not the only culprits in the healthcare industry. Excessive prices are a feature of nearly every sector in the privately run healthcare industry, including pharmaceuticals, medical suppliers, insurance companies, medical labs, outpatient clinics, and others. In the past, hospitals have claimed that the actual charges don’t matter, and that few pay the list price. “But it’s a defense that defies logic,” said Ross. “The higher the starting point on a charge, the higher the ultimate reimbursement.” Uninsured individuals with far less bargaining power are too often hit with the full list price. The effect on the uninsured or underinsured is often devastating. Hospitals increasingly tack on steep co-pays, require cash up front before administering care, use Medical Credit Scoring to determine if patients are a payment risk, and hound patients for payment afterwards. All while skimping on the supposed offset of providing charity care. A 2012 IHSP research study found California hospitals reap $1.8 billion in public subsidies beyond what they provide in charity care. A June, 2013 report by NerdWallet Health said bankruptcies from unpaid medical bills will affect nearly 2 million Americans this year, and 20 percent of Americans under age 65, including those with health insurance, struggle with high medical bills. These practices are a reminder of an ongoing hole in the Affordable Care Act, which has few provisions to effectively curb price gouging, nurses say. “Nurses will never stop fighting for transformation of our inequitable healthcare system to one based on patient need and quality care for all. The numbers for bankruptcy and financial run from medical bills plummet at age 65 when people qualify for Medicare. The best solution is to expand and update Medicare to cover everyone, and take the financing of healthcare out of the hands of the profiteers,” Ross said.